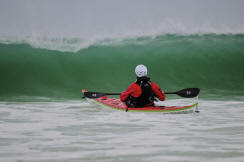 The 4th UK Storm Gathering 2009 will by Sea Kayaking Cornwall over the weekend of 19th and 20th September. This will be a great opportunity to attend a variety of courses and to explore the beautiful Cornish coastline in the company of other paddlers. On the Saturday participants can attend a selection of practical and theoretical clinics. All of these courses will take place in the Falmouth Bay area. Later on that evening there will be entertainment laid on preceded by a BBQ/meal. On the Sunday attendees will have the opportunity to explore, with day paddles along Cornwall's amazing coastline. These trips will be weather dependant, but it is hoped will take in 'The Lizard Peninsular' 'Lands End' and if the September Swells allow, sections of the North coast will also be accommodated. The Symposium is based at Tregedna Farm a short walk from Swanpool Beach. There is top quality bunk house accommodation or camping available. We are limiting the numbers to 25 Full board and 45 Camping. Those wishing to join in will have the opportunity on the Friday evening and Saturday morning to decide on courses they would like to attend.